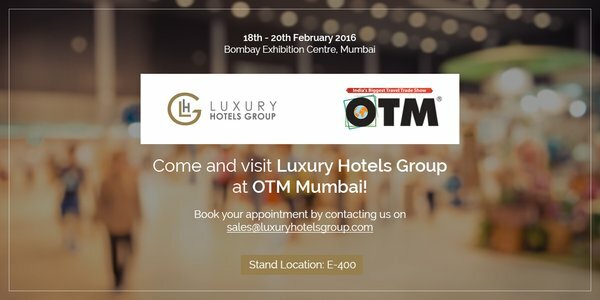 OTM is returning to Mumbai from 18th-20th February this year. Don’t miss out and make sure that you visit India’s biggest travel trade show. Luxury Hotels Group will be exhibiting at the event this year, so be sure to pop by and see us at stand E-400. If you want to create an amazing holiday experience for yourself, your friends and family, but don’t know where to start, then OTM is the perfect opportunity. You can find the top luxury brands and businesses here, making that dream holiday really become a reality. Mumbai is home to India’s largest travel market and OTM gives the nation’s top businesses the chance to reach a continent sized market. India has one of the fastest growing markets of outbound tourists. Even today, the Indian economy continues to grow at about 8 per cent every year. In 2012, India saw 15 million outbound travellers, a number which is expected to reach 50 million by 2020. Mumbai itself contributes to over half of this. Travellers are willing to pay for luxury too, with $10.3 billion spent on international tourism in 2009. This amount is continuously growing and should see heights of $28 billion by 2020. Over 2,500 participants attend OTM from 70 countries across the world. Therefore, this is the perfect opportunity for businesses and travellers alike to meet and create the perfect travel experiences. So, if you don’t want to miss out on what could be the best holiday of your life, then make sure you attend OTM this year. Life is all about creating memories, so start today and get ready for the time of your life.